Operated with the guidance of Concord H.S. Varsity Coach of the Minutemen, Derrick DeShone. 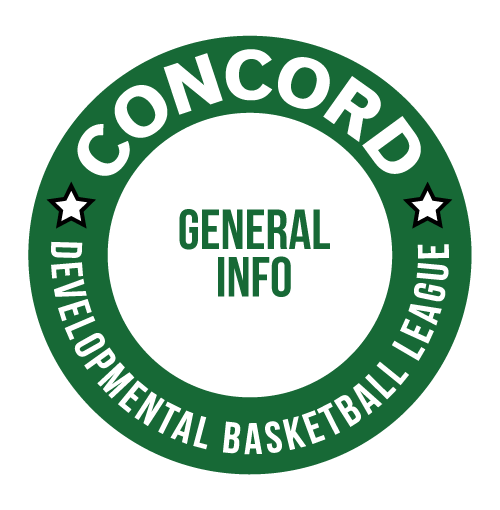 The Concord Developmental Basketball League (CDBL) is for third, fourth, fifth and sixth grade students living in the Concord School District. The boys league runs for 10 weeks from November to February. Each weekly session lasts an hour and a half, starting at 9am. The first half of the session consists of instruction and drills. Official games are played in the second half of the session. Sessions will be every Saturday, primarily at Concord Junior High School. Check the schedule for details. Player evaluations are performed on each player to rate his or her skills at both the beginning and the end of the season to show their improvement. Players are evaluated on dribbling, shooting, jumping, defense, and passing. The player evaluations are used to match the teams as evenly as possible. To finish the season, a team tournament will be held along with an awards ceremony to celebrate the achievements of the players. The league is run under the direction of the high school varsity basketball coach Derrick DeShone. The CDBL Scholarship Fund has provided scholarships since 2007 for Concord High School Senior boys. To be eligible, students only need to have participated in CDBL at least one year. Your continued support by purchasing spirit wear and refreshments is greatly appreciated. Please ensure that transportation arrangements are made for players if you are unable to attend the sessions. Seating is available for all to watch. If you have younger children with you, it is your responsibility to supervise them. They are not allowed to run around the gyms or the hallways. Enter at Door 12 at the back of the school. Spirit wear and refreshments will be sold in the hallway before, during, and after the sessions. All profits are applied directly to the CDBL Scholarship Fund. Yelling or disrespecting the referees, coaches, or players (including your own) will not be tolerated. We emphasize with the players that they worry about their own game and not the referees. Referees are high school players, many of which have participated in the CDBL program in the past. They may not always get the calls correct, but neither do paid professional referees. If it becomes a problem, you may be asked to leave. We as adults need to set an example of good sportsmanship for both our own kids and the other players.